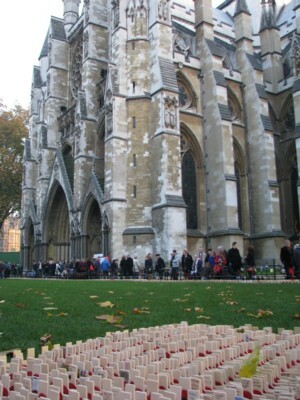 As every year around this time, Britain remembers its war dead with smal wooden crosses, almost all with a poppy attached, and a small written message, of a name or a note of remembrance. 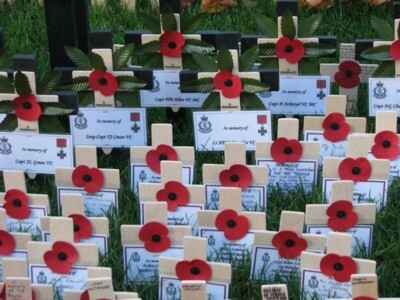 There are not many individual commemorations of this sort, with a personal photo. 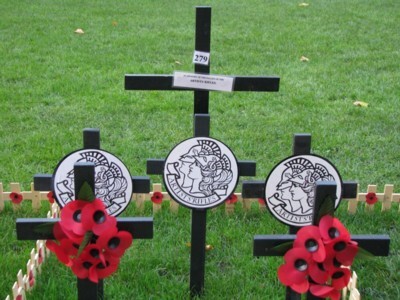 More common were clutches of crosses, with the bigger lettering used only for the names of the regiments of the men commemorated. The first ‘Captain’ of the Regiment to be elected was Lord Bury (later the Earl of Albemarle) but he did not remain in office for very long. The first Commanding Officer in 1860 was Henry Wyndham Phillips, the painter and amongst the early distinguished ‘Artists’ were John Everett Millais, G F Watts, Val Prinsep, Frederick Leighton (later Lord Leighton, CO after Henry Wyndham Phillips and a future President of the Royal Academy), R W Edis (a future CO), Holman Hunt and William Morris. The influence of the Pre-Raphaelite group, however, appears to have been more social than military! As years went by the composition of the Regiment was broadened to include many other professions. By 1893, for example, painters and sculptors represented less than 5 per cent. of the membership with architects 12 per cent., lawyers 12 per cent., doctors 10 per cent. and civil engineers 6 per cent. I am a graduate of the School of the Art Institute of Chicago–in 1995. I attended there after spending 4 years in the (US) Marine Corps, and 2 more in the Army National Guard. Since then I have also spent some time in the Air Force Reserves and worked in a war zone as a civilian contractor (not armed). Two of the people I served with in the Marines were very good at painting and drawing, and would have, had they wished, been able to have careers in the commercial art world. My roommate the first year I was at SAIC was former Army. One of my best friends there was also regular Army previous to attending, and was in the reserves. He still is. In 2006 (IIRC) he was selected for Special Forces training, and he completed SFQ at an age when many would be considering retiring from the Army. So it is no surprise to me, especially given the times. Interesting to see the name of such a socialist icon as William Morris there, although I couldn’t see any mention of exactly when he was a member of the Artists’ Rifles – it may have been before his political views took on their final form. Also interesting: when the SAS was re-formed after having been disbanded at the end World War II it did so under the name of the 21st Special Air Service Regiment (Artists Rifles). I don’t know how much continuity of personnel there was. There’s an Artists Rifles shooting club at Bisley. Natalie got there first with the comment about the SAS being the descendent of the Artists’ Rifles. This curious fact is a clue in one of the Raymond Chandler novels, The Long Goodbye. In these days when a single casualty makes the headlines, it is instructive that we remember that, not so very long ago, men were mown down like meadow grass and that a single day might carry a butcher’s bill of thousands of dead. 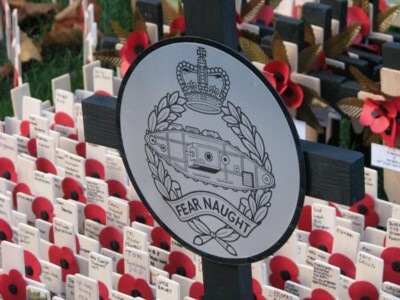 Although I am thousands of miles away, and I have absolutely no connection to that part of the world, Remembrance Day always brings me to mind of the 1st Battalion, East Lancashire Regiment. 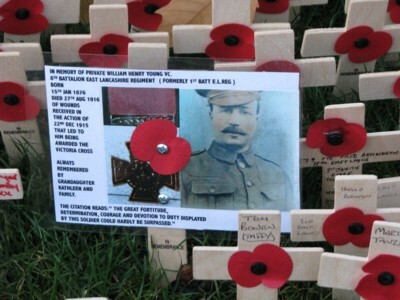 the “Accrington Pals”, and the sacrifices they made on the first day of the Somme. To lose 6 men out of every 7, within a couple of hours, is a level of carnage that we should remember. My nephew was doing homework on the trenches this weekend. Very good timing by his school! He asked what problems confronted troops. Apart from recounting memories told me by my Grandfather who served 14-18, I showed him the scene from All Quiet on the Western Front (1930) of the men in the dugout under bombardment, rats, no food then surprise order to arms…then the machine gun bam bam bam – each bullet taking a life on and on and on until the tide reversed then the French guns returned the favour on and on and on. Futile, as they had to fall back to their original trench. My son is at a Montessori school here in the United States, and the teacher there introduced the children (6-9 class) to the poppies as the way of remembrance. (They even made their own). That’s not how we do it here normally for Veterans’ Day, but she’s Scottish. 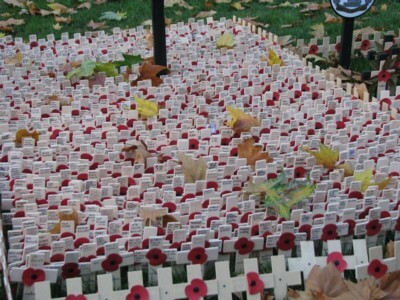 She also introduced the children, gently, to the notion that there was once a war that cost a great many men their lives and that we remember the sadness, sacrifice, and loss with the poppies. As a professional historian I try to not bring my work home–I’m not ready to show them the horrors of war and peace. But I was able to use the poppies to share with them that they had ancestors who fought in that war, and that some of them never came back. In those days socialist need not have anything to do with Marxist. Indeed British socialists often combined their socialism (which was often a hatred of large scale industry – and a view of the Middle Ages seen via strongly rose tinted glasses) with romantic patriotism. Indeed many of the leading composers (who stressed native English tunes and …..) were socialists (of this sort). The socialism of tower blocks (the socialism of 1945 and after) was not really what these people had in mind. Turning to the East Lancashire regiment man…..
That was the sort that Tolkein based the character “Sam” upon. He served with the Lanchashire men (although a Midlander himself) and came to the conclusion they were quite, unassuming, but good men. Men who would not crack, no matter what they faced, whereas he would. Some of the people I met in my year in Bolton were indeed like this. We are so estranged from the mores and temper of the times that we are almost incapable of understanding how the population of Europe in 1914 could so … eagerly join up. And we also incapable of understanding how they could accept the horrendous losses. On July 1, 1916 the Royal Newfoundland Regiment consisting of 804 officers and men went ‘over the top’, and in the course of less than 45 minutes lost 710 killed, wounded or missing: 88% loss. The Regiment was re-constituted with volunteers from the outports. We owe a debt we cannot repay. We can only remember that debt. Thanks for the note on the Artists’ Rifles! With a description of them in action at the end of 1917, while trench warfare was still in place, intended as a contrast from the semi mobile warfare that would take place later. I found it quite a sad, if heroic, account, and it did leave its mark in my memory. you are never gonna find a a helmed descriptive like this one.uswe.cause we can do better.